Categories: Funny | Tags: backyard, ballet, dog, sugar plum fairy | Permalink. Looking for a Dog-Friendly Home for Your Dog to Stay in While You are Away? Try DogVacay. DogVacay matches dog owners with great dog sitters. We’ve used DogVacay several times for our dog and signed up to be hosts about a month ago – so far all of us are loving it – especially Nina our nine-year-old daughter and Ariel our dog. Categories: Other Outdoor Places | Tags: boarding, charlottesville, dog, Save, sitter | Permalink. Our dog is an Airedale terrier/ground hog mix. You can guess what she is up to in this photo. This week’s WordPress photo challenge is Split-Second Story. I took this in our yard last week. 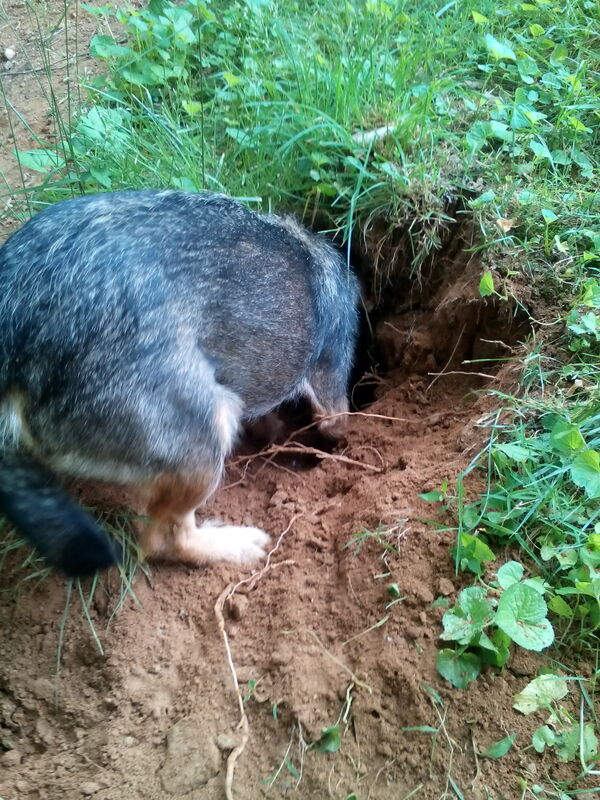 Categories: Funny, Other Outdoor Places | Tags: digging, dog, ground hog, postaday | Permalink. What is Like to Go to All 59 U.S. National Parks? 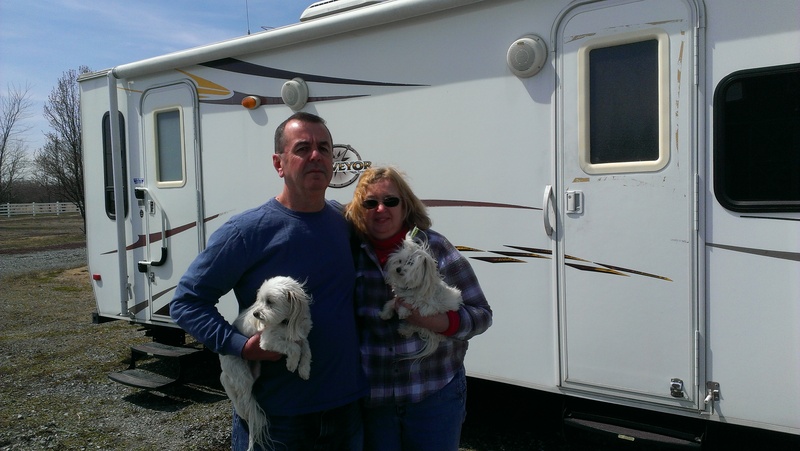 Don and Shelly Hafner are on quite the adventure. The couple is visiting all 59 parks in the U.S. National Park System in 59 weeks! How cool is that? Why are you traveling to all 59 National Parks? Our primary purpose for visiting the National Parks is to (hopefully) inspire others to pursue their goals regardless of how daunting they may appear on the surface. Our journey is not a “bucket list” trip nor is it an exercise in selfishness. Rather we are hoping it is possible to achieve a worthwhile goal with proper planning and determination. We are totally driven by the idea expressed by Mark Twain that the only things you will regret twenty years from now are the things you didn’t do or accomplish. Which park was first and which will be last? Our first National Park was Hot Springs National Park in Arkansas. We chose Hot Springs because it was the first “reserve” of land sent aside for public use by the Congress. We also selected Hot Springs because it is the closest National Park to our home. As for the last, everyone will have to wait until July 4th, 2015. We don’t share where we are going next. We regard our last National Park as our “Home” park and have been there many times. Sorry, those are the only hints we are willing to give. How are you accomplishing this both physically and logistically? What modes of transportation? What routes? Do you have sponsors that are helping? Physically our trip so far has been challenging. We don’t stay in one place too long. We are actively visiting and photographing the Parks everyday. Our days begin early and usually end after midnight. We have been on a number of challenging hikes and adventures already. How do we do it? For us, it has been an exercise in determination. As for logistics, we are getting a lot of help from others. For example, we used a travel agent for the Alaskan part of our journey. There is no way we could have set up all of the adventures she set up for us in Alaska. We have already used a number of modes of transportation. Most of our trip so far has been by driving our Ford pick up and pulling our small camper. We have also taken a flight to the Virgin Islands and a boat trip to the Dry Tortugas National Park. In July we are going to park the truck and camper for a while and use our Ford CMax. Expect to read about a seven day cruise somewhere along the way. We have received no direct payments nor do we have sponsorship. We are funding the trip ourselves thus far. We are Ambassadors for Flow397 and for the YonderApp. We have traded out promotion and professional photography services for complimentary stays at a few RV parks. Would we accept sponsorship? We are willing to listen. We are going to be in every National Park and we know that has to be attractive to a number of businesses. Are there any parks that you are timing your visit to be at a certain time of the year because that is the best season to visit? We seek moderate weather. We won’t, for example, be in Death Valley National Park in August or in Glacier National Park in January. That principle is the guide to our itinerary. We are thinking about visiting a few parks more than once. We would love to make our second visit to Yellowstone National Park in the Winter. Do your friends and family think you are nuts? We thought everyone would think we were nuts. In fact, we deliberately looked for people who might think that. Criticism from others has been rare. The most common response we received when we explained what we were doing was “cool”. One doubting neighbor thought that it was an April Fools joke (recall we started in Hot Springs on April 1st). One family member expressed some doubts. What are a few items that have proved invaluable to your trip so far? We like it when the RV park store has ice cream! We can say for certain it is not the GPS which has led us on some very inconvenient, time consuming routes. The most valuable thing so far is not an item. It has been the time that we have been able to spend together as husband and wife. We are interested in working with school children. There are two schools that are following us in Kansas City. We spoke with them before we left and have had FaceTime calls with classes from National Parks. Assuming scheduling works out, we would be happy to stop and present to schools as we travel. We didn’t plan this, but we feel blessed by being able to meet and “adventure” with people we “knew” from social media. That has been an unexpected highlight of our journey. Categories: Amazing, National Parks | Tags: adventure, National Parks, Outdoor recreation, RV, Travel, United States | Permalink. This is the time of year when we are dreaming of summer vacation. Here’s a cute video created by Disney, National Parks Foundation and National Parks. Caroline Sunshine reminds us how fun it is to be outside in parks in the summertime. Categories: National Parks | Tags: Disney Friends for Change, Kids, National Parks, Outside | Permalink. Fall was quite busy around here. I didn’t have much time for Lotto and book promo. And I’ve got to say I missed Lotto. I realized that many times, but especially on January 9th, when I had a chance to speak about the book in a local author showcase held at the Telegraph gallery and shop in Charlottesville. The event was organized by Bethany Carlson of The Artist’s Partner (Bethany is a former screen-writing classmate and instructor for an e-book DIY class that I took before publishing Lotto:). Tonight, I was browsing for the blogs of the other authors at the event. When I searched for Braver Than You Believe by Sue Mangum with Claire Cameron, this YouTube video came up and I had to watch. I guess I’m out of it because I didn’t know , or more likely had forgotten the “braver than you believe” quote from Christopher Robin. Might be time to go back and read some more Pooh bear. Categories: Lotto's Super-Awesome Unbelievable Park Adventure | Permalink. Categories: Other Outdoor Places | Permalink.